Commonwealth Bank has updated their mobile platform, with the iPhone, Android and Windows 7 Phone all getting updates to their native applications. CommBank has also released a new application specifically for the iPad. Their new iPhone app has plenty of upgraded features and offers an interactive tour for users if they wish to see the full functionality. 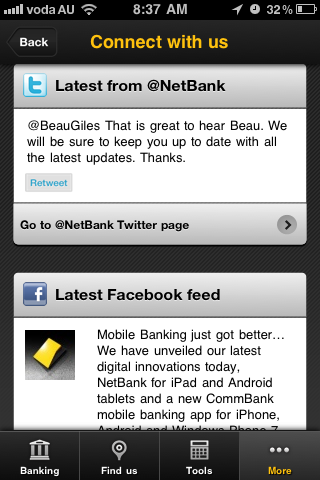 CommBank have also integrated their Facebook and Twitter feeds directly into the app so you can keep updated with their social media accounts. Commonwealth Bank has also said they are readying themselves for NFC payments (Near field communication). This means you could turn your mobile phone into a credit card, so to speak (eg MasterCard PayPass – tap and go). It will be interested to see how CommBank progress their mobile platform to incorporate social commerce.